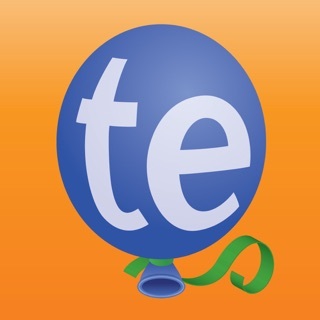 Type faster on your iPhone®, iPad®, or iPod touch® in any App using the TextExpander keyboard. 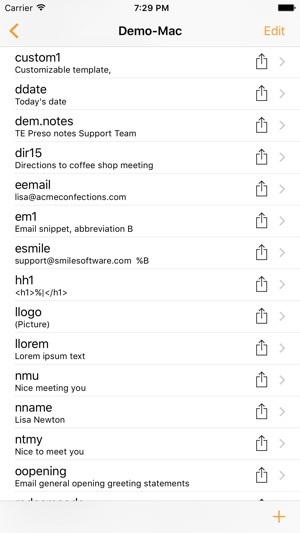 The keyboard enables custom abbreviations to expand into long “snippets” of text, such as addresses, URLs, email signatures, and form letters. 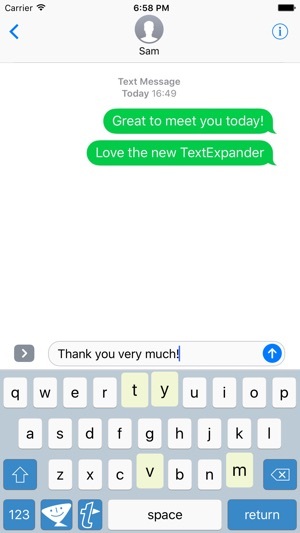 How does TextExpander work? 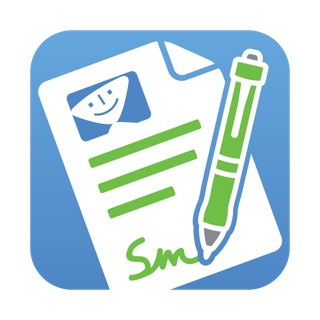 Make an abbreviation “eemail” and have it expand into “email@email.com.” You can even insert today's date automatically with the default abbreviation “ddate”! 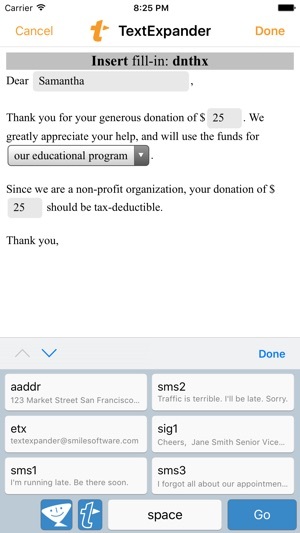 Use all your TextExpander snippets in Mail, Safari, everywhere, using the custom keyboard. 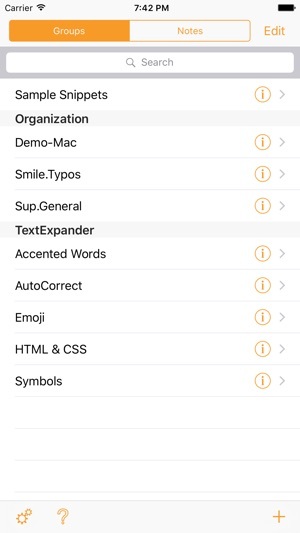 Use TextExpander snippets with any keyboard in over 70 apps with integrated support, including Byword, Dispatch, Drafts, Fantastical 2, Launch Center Pro, OmniFocus for iPhone, OmniOutliner for iPad, TaskAgent, and Tap Forms. 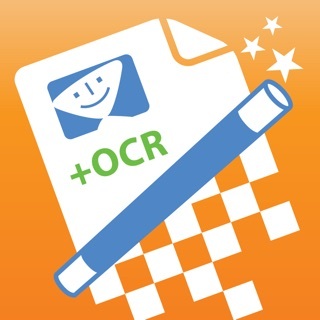 See smilesoftware.com/apps for a complete list. I left a one star review if this app because of the support experience. They were short, rude and rather obnoxious. They replied to my review and said they had no record of me contacting them. I forwarded them my original correspondence and they said they would give it “the attention it deserves”. Well about a week later I hear back from them and they basically said well even though it was you using the trial version of our mobile app that is causing you to fail the license check, we will not help resolve that issue for you, even though you are not using the professional features and have removed the trial mobile software from your phone. We kindly ask for your understanding, that technical support is reserved for paying customers. If you opt not to pay for our work, we will NOT work for you. Please use our software as-is or uninstall if you experience difficulties configuring it. I guess my difficulty is the condescending tone of this response and the fact that their mobile app is what broke it and caused it to quit working to begin with. Don’t look to this company for help even if they are at fault. I think the real magic of TE happens when you use it cross-platform. For me, I’m a regular Mac, iPhone, and iPad Pro user. I love the functionality in drafts. Saves me HOURS!! Here’s my issue. 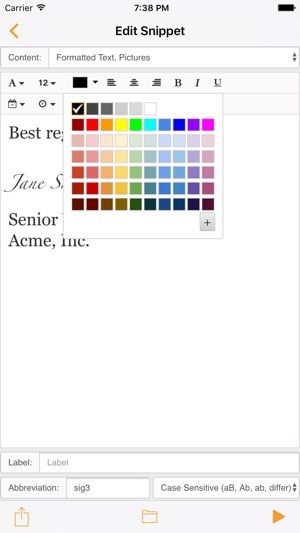 On iOS, the app performs spotty. I get a lot of crashes. I’ll open the app on the iPhone, tap a snippet and boom, it shuts down. Does this over and over. On the Mac - 6 stars! I have no problems! If the iOS app were less buggy, it’d easily be 5 stars! As other reviewers said, this requires you to install an additional keyboard in iOS and to switch to that keyboard before text expanding. Tedious and seems less convenient than just typing everything out. Then on Mac it works ... most of the time. About once a day I type my short text and it just disappears and freezes for a bit. Sometimes the expanded text finally appears, sometimes not. I’m deleting and certainly not paying for a subscription.